Earlier today, we told you that Apple’s next-gen iPad models would apparently be recipients of IGZO panel technology supplied by LG Display, Sharp and Samsung Display. Apple is probably going to unleash multiple iPad models this year, but the one that poses the most interest is the highly rumored iPad Pro or iPad Plus, which is expected to arrive with a spacious 12-inch display. A new leak coming out of Asia (as seen at Tablet-News) shows us what looks like the iPad Pro, and we’re also given a few more details about the upcoming model. 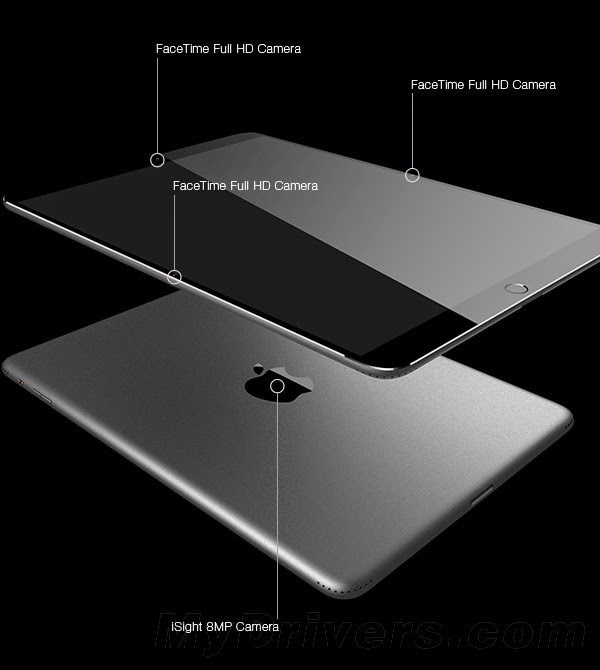 For starters, the render reveals that the tablet will seemingly have three FaceTime Full HD cameras, one located at the top and the others on the sides. It's an interesting setup which Apple might use to trigger 3D/HD video calls, but this aspect is unclear at the moment. The tablet is also shown to have a main iSight 8MP camera integrated in the Apple logo on the back. The ring around the Home button and Touch ID is also visible. We also get to see the 4 integrated speakers, one in each corner. Last but not least, we notice a (pretty wide) port located at the bottom. Could it be a USB Type-C port? Sources familiar with the matter mention that the tablet should enjoy the services of a whopping 10,000mAh battery. What do you think of this leak? Is it the real deal?